The Shahsevan were a tribal confederation in Northwest and Western Iran. To the rug and textile collector they are best know for their Sumac bags, They also made Kelims and some pile rugs and bags. A late Safavid era Kizilbash confederation created to counter balance older Kizilbash confederations. The Shahsavan was a product of the Kizilbash policies of the Safavid Shahs. It was a created Il to act as a political and military counter measure to more established Kizilbash Ils in the later part of the Safavi dynasty. 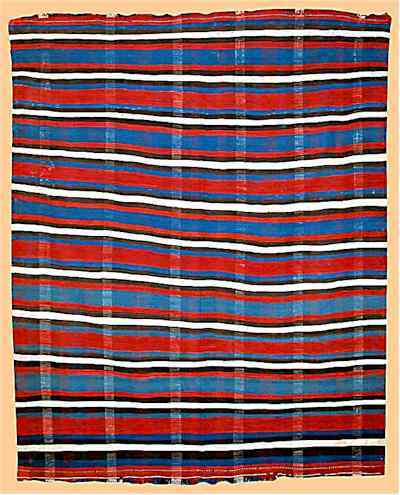 Pile rugs are a subject of controversy. Such leading lights as Dennis Dodds and Wendell Swan are exploring the Shahsevan pile rug attribution while other notables such as Raoul "Mike" Tschebul reject the possibility of Shahsevan pile rugs. 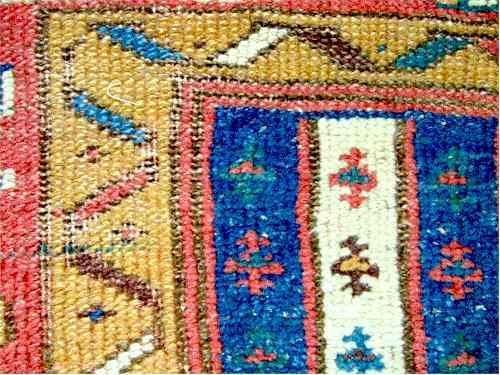 Take for instance the rug below that would normally be attributed to the Sarab area. 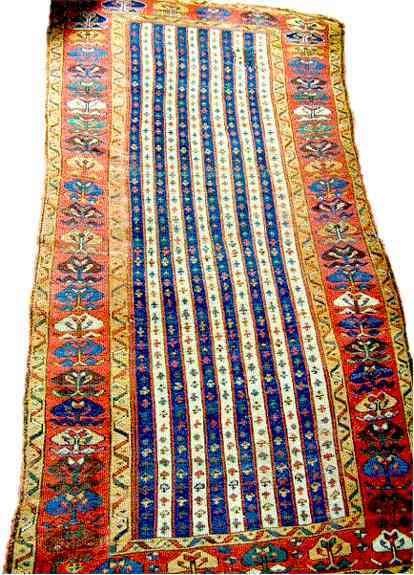 The Sarab area is the area of Mount Sabalan or Savalan as rug experts like to call it. 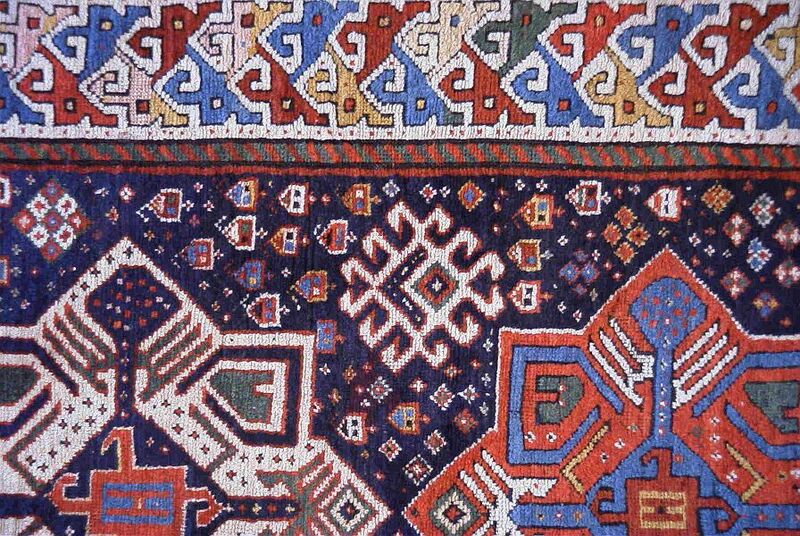 It seems reasonable to suggest that this is a tribal rug and the tribes of the area were the Sabalan Shahsevan. 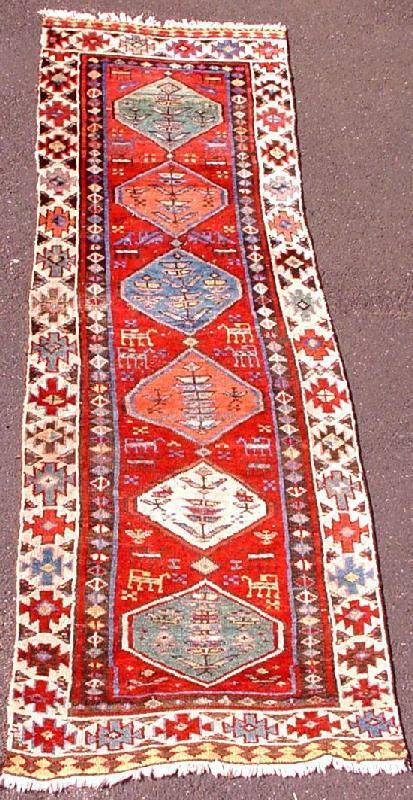 Is it reasonable to attribute this rug to the Shahsevan rather than the non-Shahsevan villages of the reason? Needless to say the debate continues. 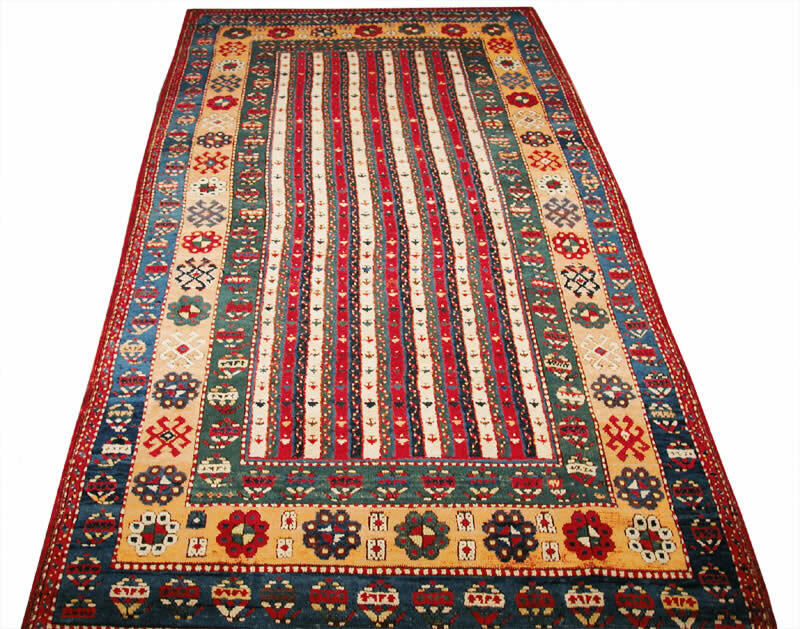 Shahsavan rugs are woven with a Turkish knot and a fairly flat back. Here the warps are rigid and the wefts are sinuous. As you can see in the sketch the warps are heavier than the wefts. It is woven with symmetrical knots. 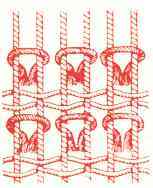 There is two shot of weft between each row of knots. Trusted Resource List Rug & Carpet Dealers In The U.S. Maqam. 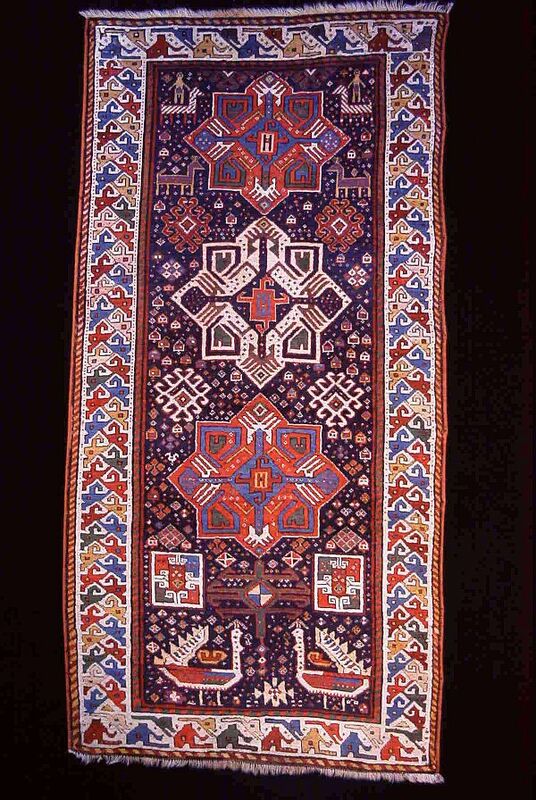 Traditionally we would attribute this rug to Sarab in Northwest Iran. 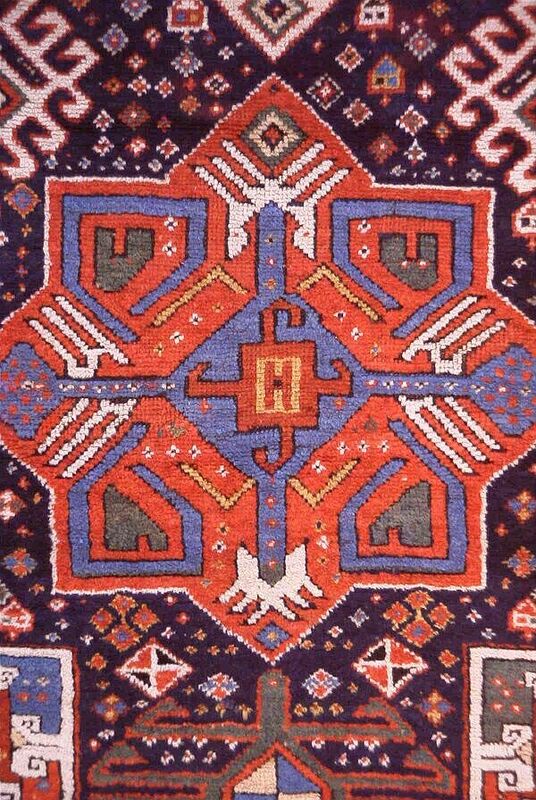 The primary fiber used is undyed camal which is both what is traditional and what is used in this rug as Dodds confirms. Sarab is on the Sabalan (Savalan) ridge and interestingly enough so were the Savalan Shahsavan. Dodds takes an interesting tact in exploring the possibility of a Shahsavan attribution. Materials: Camel hair and Wool pile. Condition: The condition is nearly mint, with very slight wear at one extreme end. A striking minimalist design with two pale blue and one red-brown medallion connected by a slender pole with diminutive "anchors". Lovely palette with clear yellow, light blue, rose, red, red-brown, dark-brown and camel. The ground is actual camel hair, with subtle abrash and a characteristic "fuzzy" back. The natural camel hair and brighter hues of dyes, particularly the pale blue and rose, may indicate a Shah Sevan origin. Dennis Dodds is a Philadelphia area specialty dealer and former American editor of Hali. An extremely rare carpet. Large areas of repiling throughout the field and border sections, pile partly low. 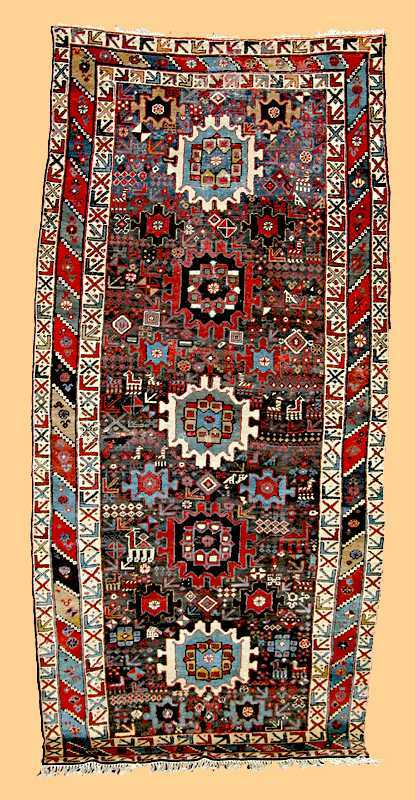 Notes on Condition: Early pile carpets of the Shahsavan are very rare. Five horizontally cut and repaired folds at the left side; new selvage; traces of age. 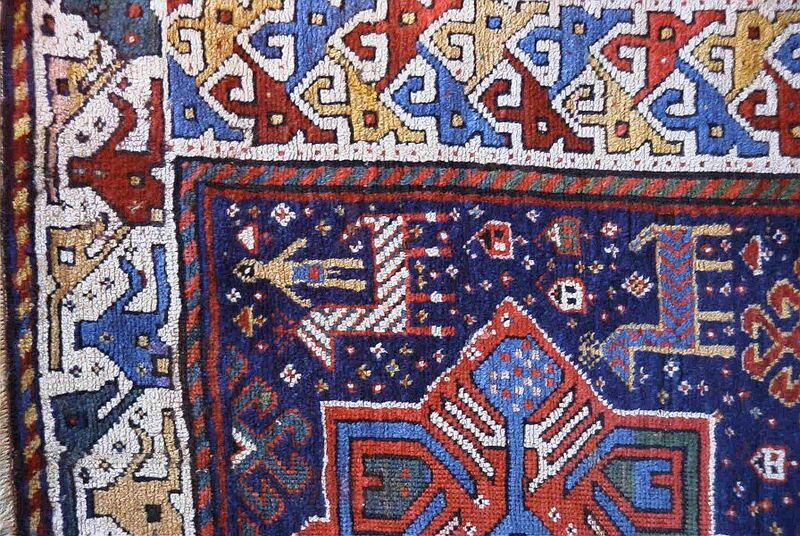 Notes on Condition: Traditional Karadja composition with a bird-border known from Moghan and Shirvan carpets, with color combinations to be expected only in very old pieces. Minimal losses to lower end, some re-knotted areas, pile partly low. Corrosion. 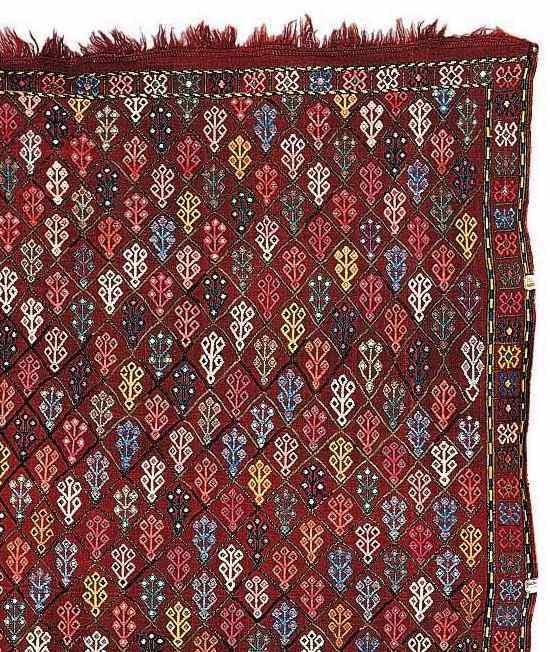 Country of Origin: North West Persia, Azerbaijan, 2nd H. 19th century. 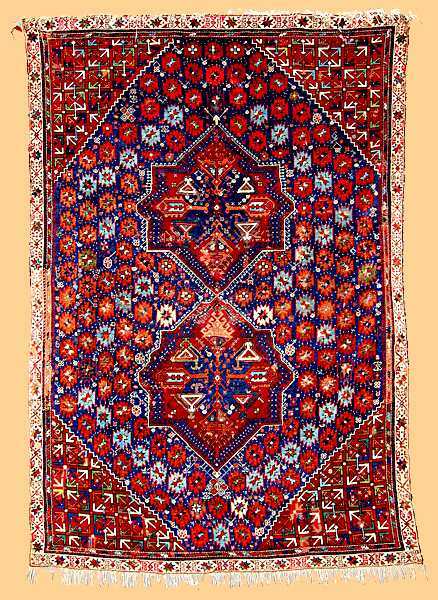 A rare pile carpet of the Shahsavan from the extreme north of Persia, with hexagon design on low-blue field. Sides again, conclusion edging tapes after-attached above, blackbrown corroded and supplemental in parts, pile in the field is low. 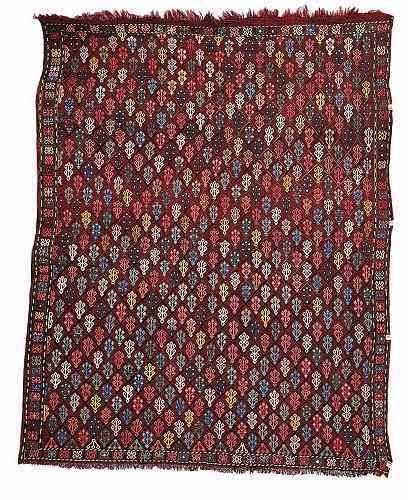 Shahsavan Carpet, Mid 19th c.
Origin: North West Persia, Azerbaidjan, mid 19th c.
Notes: Rare pile carpet of the Shahsavan. Lower end as well as a few areas in the border zone expertly restored. Pile partly low. 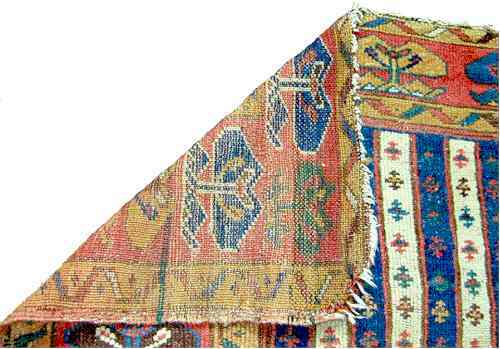 Origin: North West Persia, Azerbaidjan, 19th c.
Notes: Sides not original and overcast, ends with newly added fringes. Pile partly low with several repaired areas. 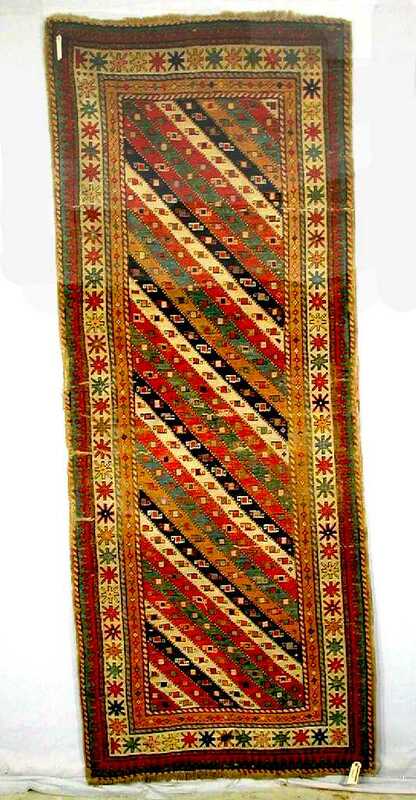 South Caucasus, late 19th-early 20th century, 7ft.8in. x 3ft.2in. 2.34m. x 0.97m. Overall wear, heaviest in center, minor kink damage. 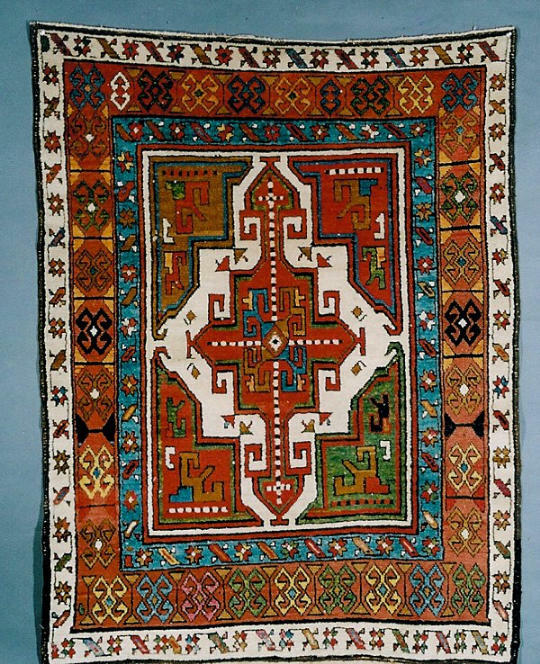 Woven about 1870 in the Caucasus. It is in very good condition. The size is about 3x4. Shahsavan Rug mid 19th c.
Full Description: quite good pile, small excellent restoration. 11ft. 3in. x 2ft.9in. Overall even wear, slightly heavier in places, small hole, main border missing all round. Notes on Condition: Literature References. In good condition, sides partly overcast, minor losses to ends. Old. 94 x 294cm. Diamond and animal motifs, madder red base. Notes on Condition: An obviously very old rug of this type with particularly nice colors, most probably the work of a Shahsavan weaver. Ends and sides restored, a few re-knotted places, altogether in good condition. Size: 6 ft. 5 in. x 4 ft. 11 in. 10 ft. 10 in. x 3 ft. 8 in. 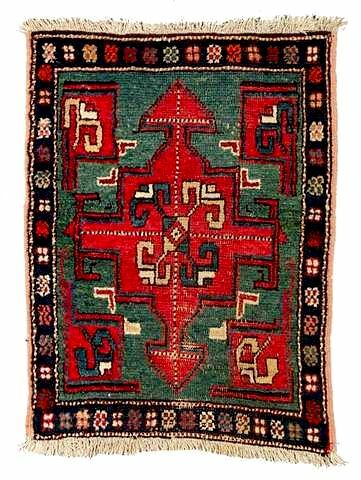 Description: This rug has a shaded camel field scattered with various geometric motifs, flower heads, and birds. This all takes place around a central column of four polychrome hooked lozenges containing geometric motifs and palmettes. There are localized areas of wear, as well as one or two small patch repairs. The selvages are fraying in parts, and a few knots are missing at either end.